Loved By Choice: True Stories That Celebrate Adoption is a much needed book. As a society, we've been inundated with negative stories about adoption and that can grow very wearisome. 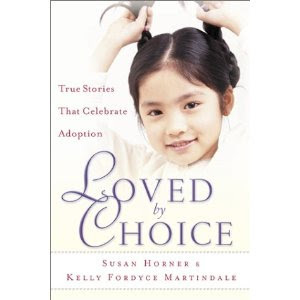 The authors/editors of Loved by Choice, Susan Horner and Kelly Fordyce Martindale know the struggles adoptive parents face, as well as birth mothers, families and the media. They compiled a list of personal stories of adoption that focused on the positive instead of the negative. I picked up this book because I needed to hear someone say something good about adoption for once. And I should preface that remark by saying that we have several dear family friends who have walked the road of adoption before us. They have encouraged us, prayed for us, and stood by us when the going got tough. They remind me that certain struggles are par for the course, and that God makes families. That is true. He does. And He does so quite beautifully, if you ask me! I had concluded a conversation with one friend about the beauty that is our own adoption story and then I stumbled upon this book and allowed myself a week to just focus on this one book. This is obviously a subject I feel that I could talk a great deal about. It is also a subject I've become quite opinionated about. It's also a subject that I cry more tears over now, than I did when we first signed up to adopt Bookworm2 about three years ago. Then again, I'm far more emotional about being pregnant with Bookworm3 than I was about being pregnant with Bookworm1. Why is that? Time. Pain. Perspective. Blessing. I see the benefits and joys of parenting Bookworm1. I see what he is becoming and what having children actually means and I am grateful. I know that bringing a child into our family is something that comes as a result of God's blessing. Being physically sick or suffering some heartache to be able to pick up a child, look into their eyes and say, "Oh, goodness. Can you possibly IMAGINE how much God loves you? Because I can't even wrap my mind around how much *I* love you!!!!" is worth everything and then some. That, my friends, is the statement of adoption for each one of us who are Christians and who have become a child of God. We cannot even begin to imagine the depths to which He loves us because we cannot comprehend the cross. The impact on my life as a result of being a child of God is indescribable and overwhelming. I am His and He is mine. That is what this book is about. Children becoming family. Family becoming. Secondly, I was greeted with a lot of curse words within the first chapter and then main family unit seems to be broken in some strangely mysterious way that just made me, well, not very impressed. I had a hard time getting into it and so I just decided not to spend anymore time on it. This is one of those times I'm glad I didn't actually pay money for the book. I still think the premise is intriguing but the time travel issues involved in this book was questionable at best and I didn't like how time travel was used to manipulate people. Or, at least, that seemed to be the way the book was going and it made me uncomfortable. I definitely felt like I should mention that I ended up not liking this book, as I mentioned it and hosted a giveaway with the title. That makes for two books I've mentioned without reading around here in conjunction with a giveaway that I ended up not liking! Lesson learned. Back to my original statements to publishers that I won't post information about a book that I haven't read for myself first! If you see it on this site, it means I've read it and, at the very least, I didn't hate it. (And then again, sometimes I mention them even if I did despise them.) Anyway, we won't be having any of that anymore! Have you had people say negative things about adoption? I can't imagine. 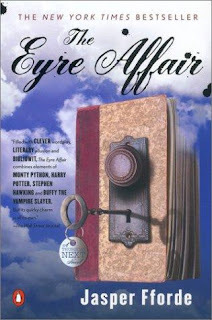 The Eyre Affair doesn't sound like my cup of tea, either. I gave up on The Eyre Affair within the first 10 pages. I just didn't get it. I thought it would be much better than it is. Too bad about The Eyre Affair. It sounded like a really intriguing book. I have to admit I was expecting that you probably wouldn't like Eyre Affair. I read his Nursery Crime book. I think I liked it ok, but it was strange. This I just never bothered to read, I'm not a big fan of sci-fi and I knew that this was an alternate ending to Jane Eyre. I just couldn't imagine liking a book that messes with Charlotte Bronte's book... it's like all those wanna-be Austen writers. Anyway, I don't think you missed much. But then again, it could be just a taste thing. Loved By Choice--sounds great, I would like to read it as well. As an adoptive mother to three, I have heard much negativity about adoption as well, and get scared when I read adult adoptee blogs. But then, I know several adult adoptees in person who are unanimously positive about their experience. I rec'd an email from one today which said "STOP READING THOSE BLOGS!" chuckle Nice to have two encouraging comments on this subject today. Okay, I should have said something before, but I let my love of the series blind me. I will speak up in the future if I see you're going to read a book I don't think you'd like!